The American flag is an emblem of freedom and sacrifice deserving of the utmost respect. When it comes to storing the flag instead of flying it, the manner in which you fold it is important. Here are the steps in how to properly fold an American flag every citizen should know. The first action in how to properly fold an American flag is to find another person to help with the folding. A flag is a bigger object and you want to fold it without letting it touch the ground, so a buddy system is best. One person should hold one end of the flag while the other person holds the other end to make folding easier. Start by folding the lower half of the striped section over the field of stars. Make sure you fold it below the grommet into a gutter to guarantee there will be no red showing in the end result. Make sure the crease is tight and the corners are perfectly aligned with the first fold to get the correct appearance. Bring the striped corner of the folded edge to meet the offset edge of the folded flag. It's crucial to begin with the folded edge when creating the triangle, to ensure the folds align correctly in the completed end result. Just remember to always start folding with the stripes and work your way towards the blue field. This will guarantee the stars are the visible part when the final act of folding is done. The next step in folding the flag is to take the outer end point and turn it inward. From there, make a second triangle parallel to the open edge. Continue folding in a triangular method for the remainder of the flag until you reach the end of the material. For the average standard-sized flags, this method will require thirteen folds which is a nod to the original colonies. 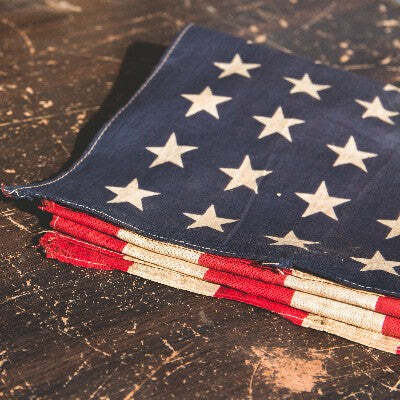 When the flag is completely folded, and the only visible part is the blue field of stars, tuck the end into the fold to secure it in place. The end result should be a flag folded with neat edges that shows only the blue, showcases four stars in an upward point position, and has corners that are pointed for easy placement the flag in a viewing case.